With its striking faceted exterior design and stunning crystal starburst, Swarovski is the centerpiece for the brand new Grand Bazaar Shops. 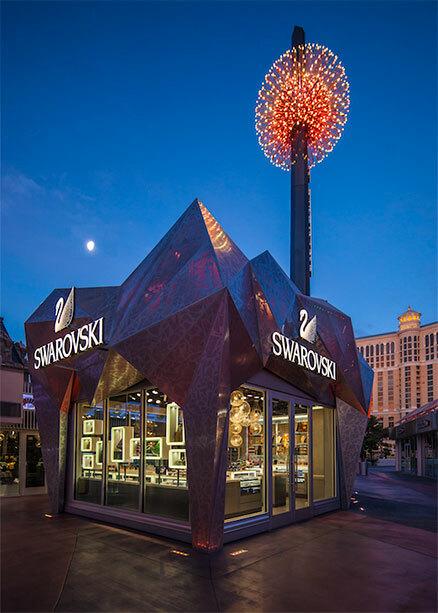 Las Vegas may be known for some of the world’s most dynamic venues; however, Swarovski’s newest boutique at the Grand Bazaar Shops is making quite an impact on the famous Strip. The Swarovski Midnight Celebration is a three minute, fully immersive program designed to entertain shoppers and passers-by. The centerpiece of the production is the YESCO-designed crystal and LED starburst light fixture. With over 1,800 individually programmable points of lights the starburst is perched 14-feet above the store. Hundreds of individually illuminated Swarovski crystal spheres; each positioned at the end of custom fabricated and highly-finished metal rods appear to burst from the center of the star during the nightly shows. The store’s angular and perforated skin was fully fabricated in YESCO’s Las Vegas facility, utilizing a complex square tube metal structure that was designed and engineered in-house with precise attachment points to secure the skin to the base building. Seamlessly integrated into the store façade is a 6mm high-resolution LED display with an angular and faceted design. Hidden beneath the skin is a fully-programmable LED lighting system that projects color coordinated and synchronized lighting sequences through the perforations during evening hours to further enhance the experience. YESCO also fabricated and integrated canopies, lighting and storefronts for other tenants at the Grand Bazaar Shops.